President Calvin Coolidge, accompanied by his guide, John LaRock, frequently fished for trout on the Brule River during the summer of 1928. Calvin Coolidge served as President of the United States from 1923 to 1929. Coolidge, known as “Silent Cal” for his minimalist use of words, held that government, including the Office of the President, should interfere as little as possible in the lives of its citizens. So it was really not out of character for Coolidge to pack up his belongings, gather his staff and temporarily move the “White House,” and thus the center of American politics, to a fishing lodge on the remote Brule River, a few miles south of the small northern Wisconsin town of Brule in Douglas County, for the summer of 1928. The precedent for a summer White House had already been set by Coolidge the year before when he and his wife Grace spent an entire month in the Black Hills of South Dakota, staying at the state game lodge there. It was from the Black Hills that he issued the famous statement, “I do not choose to run for President in 1928.” Without the tedium of a campaign to worry about, Coolidge made plans to spend nearly the entire summer on the Brule - fishing, relaxing, and sometimes tending to the affairs of the United States. Coolidge would pass the summer in northwoods comfort at Cedar Island, the very private estate of the late Henry Clay Pierce. He arrived at Brule in mid-June, accompanied by no less than 60 soldiers, 14 house servants, 10 secret service agents, and about 75 reporters. The arrival of the President of the United States and his entourage was the most exciting event to ever hit rural northwest Wisconsin. For weeks prior to Coolidge’s arrival local and state officials, businessmen, and the general citizenry scrambled to prepare for the President. “ ‘Well,’ said the citizens of Brule, all 200 of them, ‘We must dress the place up a bit.’ They cast a reflective eye down the five streets and over the three town pumps. The “dressing up” included what the Associated Press described as “wooden arches of native rough timber” erected over the main road through town for which Brule citizens themselves had to “chip in” since Brule had no local government. Since it was well known that silent Cal and his wife Grace were staunch churchgoers, the Congregational Church there received a fresh coat of paint as well as a new roof. Outside of town preparations were made as well, and in a big way. While Coolidge planned to spend most of his time at Cedar Island, he was still President of the United States, and had the affairs of the country to manage. Superior Central High School about 30 miles by road from Cedar Island, became a hub of activity as the location where Coolidge would conduct business, receive official guests and communicate with Washington. The school library became Coolidge’s personal office. The high school was transformed into a communications nerve center, albeit 1920s style. While Coolidge’s decision not to run for reelection was national news, locally the most talked about issue focused on Coolidge and his fishing intentions. As it still is today, trout fishing was serious business on Wisconsin’s most famous of trout waters. Speculation about silent Cal ran through Douglas County like wildfire. Calvin Coolidge was not known for his outdoor abilities. He did however develop a latent interest in fishing while vacationing in New York’s Adirondack State Park in 1926. Coolidge intended to take full advantage of the incredible fishing opportunities the Brule offered. And for this he needed a competent guide. John LaRock, one of the most experienced and highly respected guides on the river was recommended. Coolidge accepted the recommendation and hired LaRock to be his primary guide for the summer, inadvertently thrusting the man into the limelight. LaRock was paid $2.00 per day to guide the President, and the two spent a considerable amount of time together on the dark waters of the Brule, although probably most of it in peaceful silence. 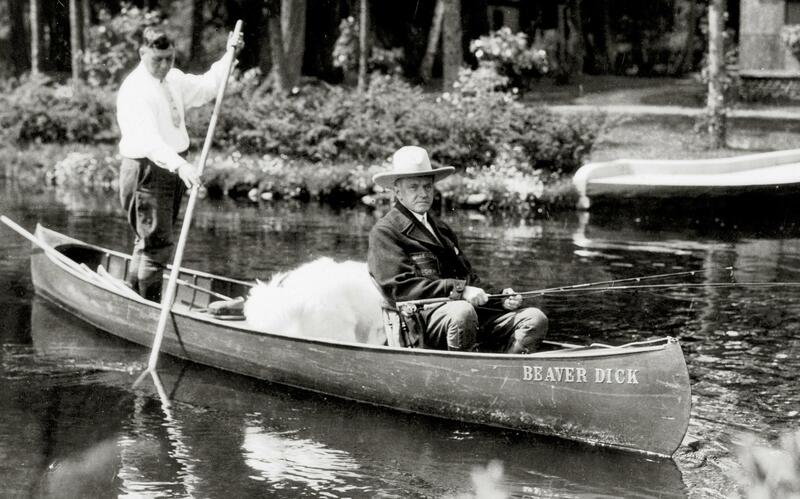 Coolidge took easily to the almost daily routine of climbing into his favorite Cedar Island canoe, with LaRock in the stern and Coolidge’s white collie “Rob Roy” ever present in the center, to ply the Brule’s secret trout holes. From the very first reports of Coolidge’s fishing activity the ever important worm question was close at hand. Anxious to get some fishing in, Coolidge broke out his fishing pole within hours of his arrival at Cedar Island. It also was reported that he had asked for worms. But several days later reports began to surface seemingly designed to put the worm issue to bed. Perhaps after catching wind of the importance of Coolidge not to be perceived as a worm man, White House staff or the press itself tamped down Coolidge’s reputation as a bait fisherman with firm reports that the president was not using worms to catch trout on the Brule. Coolidge clearly reveled in fishing the Brule, and he did so as often as possible. Some voiced concern that he was ignoring his Presidential duties, infrequently venturing to his office in Superior. The President departed northern Wisconsin on September 10th, after a brief farewell address in Superior. There is little doubt that Coolidge was deeply touched by the magic of the Brule River during the summer of 1928, the summer when he learned to fly fish for trout and paddle a birch bark canoe. He told the crowd that he would like to come back to Cedar Island but it never was to be. After his term expired Coolidge largely withdrew from public life. He died of a massive heart attack at age 60 in January 1933, a little over four years after the summer of the White House on the Brule.